Yes, you can decorate without destroying your budget. Proof positive is found in the newest Artzzle post category. It was going to be named “Fun Finds” because I get so much fun and satisfaction in finding cost effective items. But we all want a beautiful home and with budget such an important factor for most of us, hence “Budget Beauties”, to help demonstrate what can be done on a low-zero budget! I’ll share recent fun finds, where they were found and what they cost; from one-of-a kind pieces to great items from retail locations. Pictures above feature several great finds. 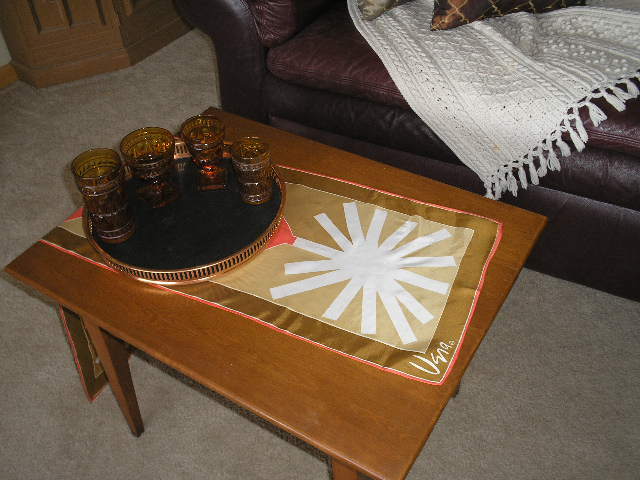 The petite, solid wood coffee table ($9.99) and the unique, copper serving tray ($0.99) were purchased in recent trips to an area thrift store, Hand-To-Hand Thrift in Pease, Minnesota. 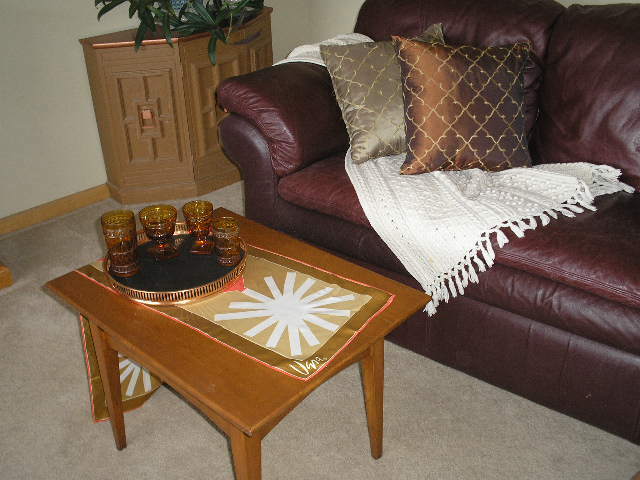 The beautiful pillows were brand new items ($4.99) purchased at Discovery Thrift in Milaca, Minnesota. The glassware is part of a 24 pc set (nearly new @ $7.49) also found at Discovery. Finally what I think is a fantastic find, is the VERA scarf for $1.00 from another area thrift store “His Savers”. Scarves are great “double-duty” items because you can use them decorate your home OR yourself! I cap my scarf budget at $2.50, so if you catch this link VERA NEUMAN, you’ll appreciate my special love of VERA items, especially at that price. Pictured below, at eleven years they aren’t recent finds, but our boys are certainly on our “most beloved finds” list. 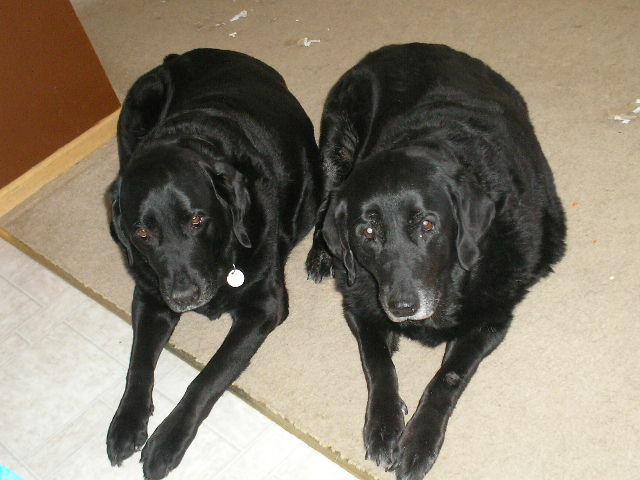 Fozzy and Freddy were found in the home of a daughter of one of my co-workers at the time. Litter mates from a small, yellow lab mom and a huge black & white newfoundland dad. Twelve of thirteen pups survived and Fozzy was our first choice. We already had two older dogs at home and wanted to transition a pup in to cushion an upcoming loss. But as we visited each week, my heart ached for Freddy as the runt (with a slightly deformed lower jaw), because no one had claimed him. I cried about what a shame it was because he was just so darn cute. Hubs gave me a hug and said that we had two training crates at home … so for a short time we had four dogs! Cinnamon, our lovely lab/golden girl left us six months after, and almost a year to the day later, we lost Buddy, our lab/sharpei mix. When I introduced Artzzle, I told you that home, family, friends and pets were most important to me. I meant it! Enjoy our finally found Spring and as always … don’t stress, just start! This entry was posted in Budget Beauties by Cheryl @ Artzzle. Bookmark the permalink.